Try our scrub now and leave your skin with a young healthy glow! Since the age of 13, I’ve been a huge fashion enthusiast…the type that examines and critiques every runway look the day the show happens. So you can imagine my excitement upon learning that Loehmann’s department store carries Betsey Johnson, Calvin Klein, Free People, D&G, French Connection, the list goes on. If Forever 21 is your thing, great, it’s in Union Square. But these designers and brands make their clothes in higher quality. They last up to ten years rather than half of one, so finding a great piece of theirs for $10-$50 feels amazing. And when you’ve used this 20% off coupon, you’ll walk out of their with genuinely nice clothes, feeling that much more amazing. It’s getting cold and wintry about, so this shirt would be perfect for layering and still looking chic. Wear over a tank top of any length and color, and the design people see when you take off your coat will say, “I’m pretty and upbeat, and cutting edge.” You can layer pretty much any scarves or jackets over it as well. Okay, this may look like a forward style (not to mention it’s “all over the spring runways,” as i can hear tyra or somebody say in an America’s Next Top Model episode), but trust me, throw one of these over a (white, black, or neutral) outfit you loved but have worn a million times, and it will make you and your aura look and feel fresh and unstoppable, I promise. Both of the above labels, Free People and DKNY Jeans, are sold at Loehmann’s! 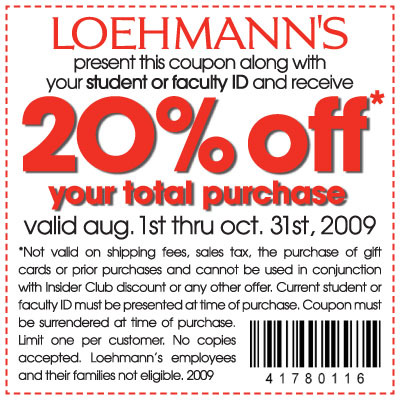 Enjoy this coupon. Love, SM Mag. 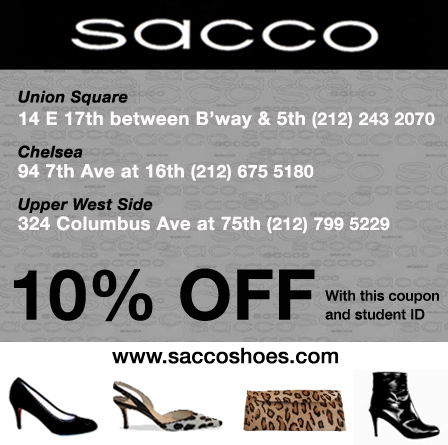 Sacco Shoes is all over the city, great shoes and bags at good prices! 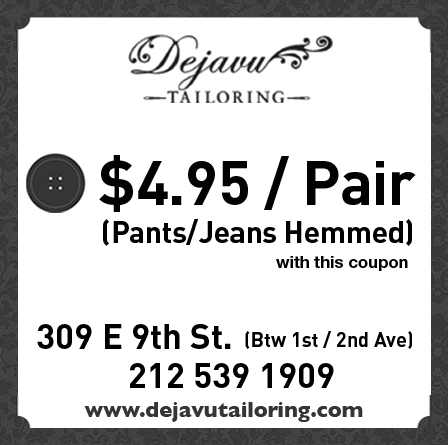 I wish I knew this deal existed earlier, I never got things hemmed cause I feared the price! Awesome! When I get a twinge of syntax-block, I stare out at the grey roofs with black, green, or grey doors south of the 17th floor office I’m writing from. The only grey rectangle that holds up a human right now is the one three blocks south that held him/her up yesterday as well. Why is this man/woman in a tan jacket and black pants and shoes lounging under the sky while nobody else is? While you ponder that question I’m going to go on and on about myself – surprise, I’m sure! Technically talking about myself right now is talking about you, though. I can count with my left hand the number of students I’ve met who commute from their parents homes, so chances are you either dorm or independently found yourself an abode off campus – me, the latter. I enjoyed my incoming year in NYU’s Third North well enough, but campus costs and even a highly disturbing moral issue prompted me to look elsewhere in Manhattan real estate for a living space. NYU dormitory options for second to fourth year range from $9,212-$19,808 for the school year, including winter and spring recesses. Most of us are in class give-or-take four months in the fall and four in the spring, so a sophomore could potentially pay almost 20,000 big ones for about eight months if they want a single (own kitchen and bathroom). That divides out to $2,500 each month. My friend Amber pays $2,000 a month for her own studio, five blocks from school, with a south-facing skyline view, a doorman in her building, and no R.A. to answer to when her 21-year-old peers drink some beers. And she didn’t even pay a notoriously deal-savvy Manhattan broker to find her place. So honestly, the dorms are probably overcharging you by a landslide anywhere on the island, and definitely are if you go to NYU and don’t qualify for low cost housing. So a few strategies are to search craigslist.org for shares, to check out an apartment building’s listings in person, or to know sombody who has a room available and like the person enough to live with them. If you’re lucky enough, a few of your friends may even decide to move into a 2-4 bedroom place together (this will save you all money because the utilities will be one bill and each person’s rent usually decreases with the more bedrooms the place has). Personally, I went the craiglist route. I’ve been living in the East Village (not in Alphabet City east of Tompkins Square Park, but actually in the middle of the cute, historic village laiden with sweet restaurants, vintage shops and bars) for about 9 months.. and I even moved out for the summer and back in. We have a marble kitchen and bathroom, large living room with an exposed brick wall, jacuzzi tub, and roof deck. My bedroom is small but I pay less than $1,500 per month + utilities (electric and internet). Steal! The idea I’m trying to pass on is that you can find something affordable on your on. Step up and defeat the dorm-money-machine and you will personally and professionally grow from it. You will learn about New York real estate and brokers, even if you never use one. If you plan on making your career in this city, the quirks and issues you’ll realize by renting will be knowledge you learn now that you won’t have to struggle with once you’re a recent grad, trying to find footing in the harsh New York job market! Just sayin’. An important part of my daily routine is balancing my meal components for the day, starting by planning at breakfast time. I wish I weren’t obligated to, but with my busy schedule keeping me out of my apartment for sometimes twelve hours on end, I plan what type of food I’m going to eat ahead of time. For example, if I have a yogurt (always on sale and “Low-fat”) in the morning before class, and wash it down with some natural fruit juice (V8 and Tropicana are sold at every grocery store), then I plan on eating more vegetables and bread after my first class. A grocery store I didn’t even know about until i read Student Maximus is Associated Supermarket in Manhattan. 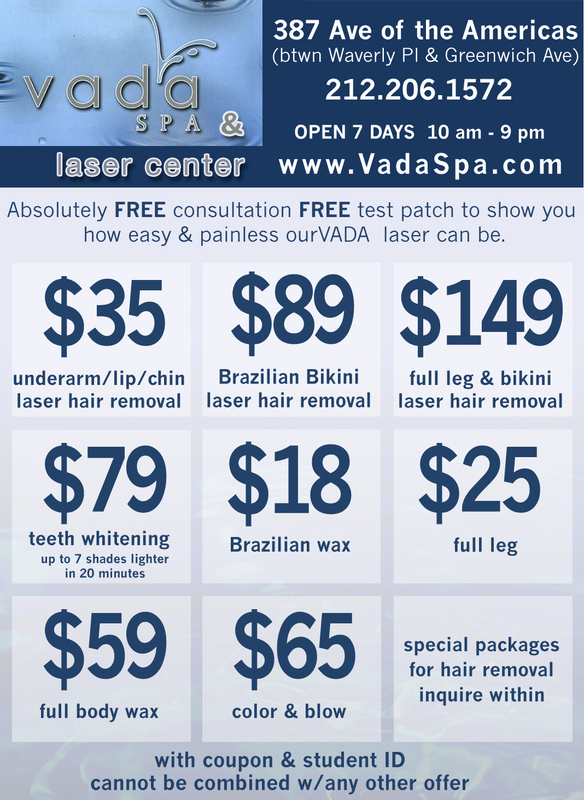 The prices are great and student coupons are in the magazine. (Here’s where I might differ from you in two ways: I’m a vegetarian and I don’t have a school meal plan. But I’ll elaborate more on those later.) I keep vegetables in the fridge at all times – these frequently include sun dried tomatoes, cucumbers, tomatoes, kalamata olives and lettuce. I have pita bread and low-carb wraps of various grain count and flavor. Sounding appetizing? Maybe if your a raw-fooder or vegan… I’m not either so I do want to address protein and efficient ways I recommend to get yours. Healthy protein comes in said yogurt, soy milk with cereal, and nuts, like maybe a bag of almonds in a schoolbag. 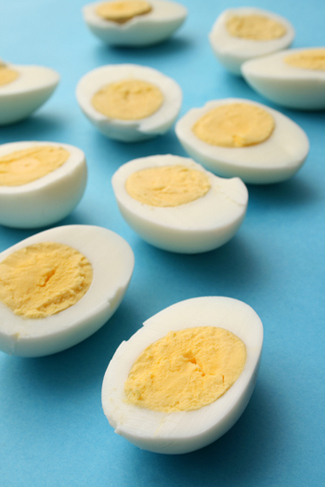 And breathe easy, egg lovers, because I’ve got your hard-boiled egg cooking tips right here! Some college students may never even have used a stove before. I’ll admit that I needed someone to show me how to light the stove sometime within the same years that I was smoothly 2,000-ing SAT tests. They look and taste and treatcha good! -You can place them in cold water until you like their temperature or just dry them off and then refrigerate. I put them back in the carton and make note of which 6 eggs are boiled and which aren’t (or else I eventually run into a literally sticky situation). *This item falls under Green Tips that I Live by. Walking/riding/blogging around New York City, there is always that statement tickling the back of my mind: I am a college student. Shopping, dating, commuting, everything – my class schedule and school year budget remain on the brain. This is clearly the part of co-ed life that will mentally ready me for the Responsibilities Being an Adult Brings one day – after graduation, of course. I am 20 years-old, and I matriculate at New York University, better known as NYU. I pay top dollar tuition with help from my education-appreciatin’ father and a small amount of financial grants. Diverse group of co-eds that we are, many of us actually do receive financial assistance through the university. I say “actually” because our school has a probably accurate reputation of having a large number of wealthy trust-fund types – and even famous people – in our student body. According to collegeboard.com, though, more than half of fall 2009’s freshman class were offered financial aid. In other words, I hang out with a lot of people who like cutting the excess fat off their credit-or-debit bills – or better yet, not consuming the excess in the first place. See, I’m on this ride with you. And with the help of Student Maximu$, we can save our dollars (and souls?) together.